TWSF decided to buy a slow cooker a few months ago to help us create those hearty dishes that like to sit and cook for awhile. To date we have only used it for one dish (homemade meatballs), but I'm guessing it will become a staple kitchen appliance when the temperature drops and everything wants to be slow cooked. You absolutely do not need a slow cooker for meatballs, but it definitely comes in handy during parties when you want to stop paying attention to the stove and start paying attention to your gracious guests. 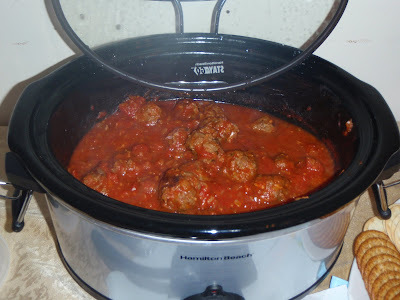 Besides, who doesn't want a pot of meatballs smelling up their kitchen for hours on end? This meatball recipe is easy and has been a big hit with our friends (read: "There is something besides alcohol at this party?"). You can really use whatever combination of meats you like (beef, pork, veal), but I keep my costs low and stick with just beef. 1. Heat olive oil in a sauté pan over medium-high heat. When oil is heated add onions, garlic, parsley, and cook until translucent. Remove from heat and set aside to cool. 2. In a bowl, mix meat with egg, breadcrumbs, parmesan, and basil. Generously season with salt and pepper. 3. Mix cooled onions, garlic, and parsley into meat mixture. 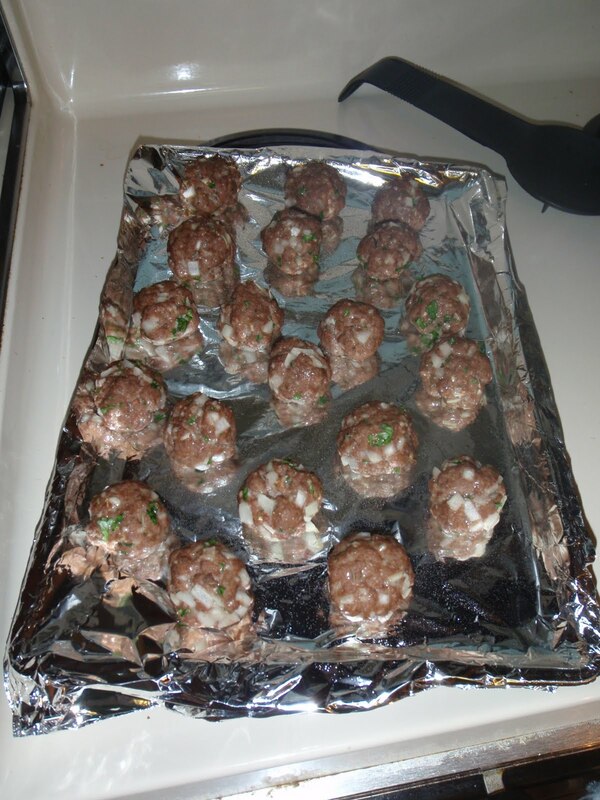 Use your (clean) hands to thoroughly mix all ingredients and shape into medium-sized meatballs. 4. Spray a cookie sheet with cooking spray to prevent meatballs from sticking. Place meatballs on sheet approximately 1 inch apart. Bake for 20 minutes, turning meatballs halfway through. 5. Once meatballs are seared, place in large pot on the stove or in a slow cooker with Chuck's sauce. 6. Serve meatballs out of your slow cooker or pot with pasta or as an appetizer with slices of French bread to soak up the sauce. **LEFTOVERS: Our favorite thing to do with leftover meatballs is make meatballs subs. 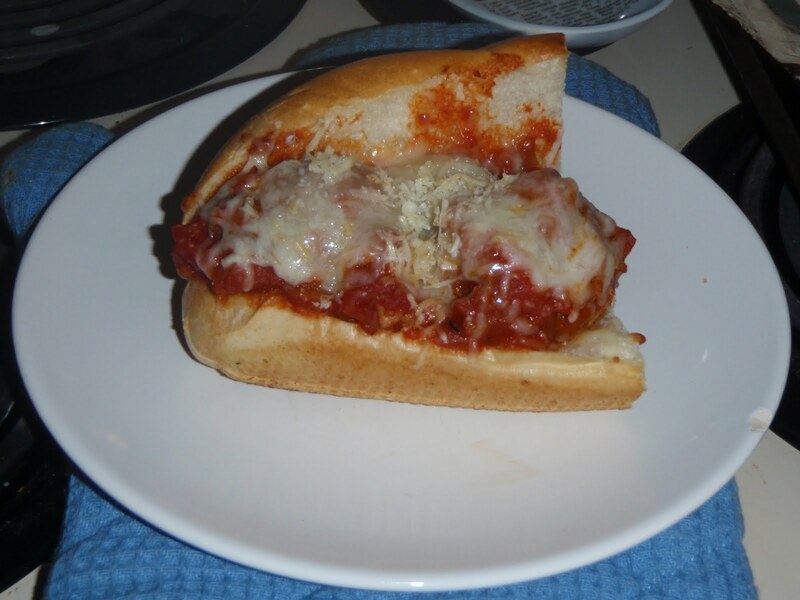 Toast a roll for a 2-3 minutes (we use French bread), add meatballs, mozzarella, and parmesan and toast for another 4-5 minutes. YUM. I ate some of this, and it was delectable!